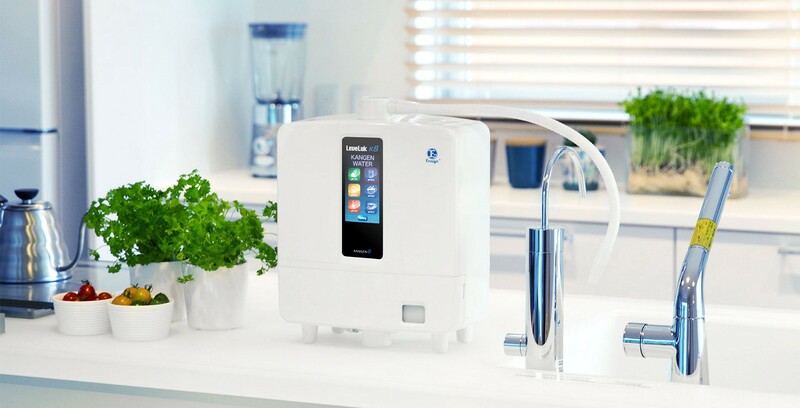 *A water ionizer (also known as an alkaline ionizer) is a kitchen appliance. It changes the structure of the tap water into a water full of Electrolytes, full of anti-oxidants (anti-aging), into a water that is way more hydrating — because smaller in particles and that produces fresh, clean & really delicious water at different alkaline — acidic pH levels. Kangen™ Water: (3 different pH levels): this type of water is perfect for drinking and healthy cooking. It works to restore your body to a more alkaline state, which optimizes health. Drinking Drink 2–3 cups of water first thing in the morning. Compared to tap water, Kangen Water® has no unpleasant odor, tastes lighter, and has a pleasantly sweet flavor. Food preparation, washing and cooking Rice, Coffee and tea for which taste and aroma are everything, Plants, Animals, Kangen Water® gives you optimal hydration. Staying hydrated is crucial to living a healthy and well-balanced life. Kangen Water® contains the minerals calcium, sodium, potassium, and magnesium. Unlike reverse osmosis, which strips away even helpful minerals, these are not filtered out of Kangen Water®! Clean Water: For baby formula and to drink while eating — also medications need to be taken with this water. Beauty Water: Not to drink — For skin, acts as a toner for a beautiful toned skin. Awesome for shining hair as well. Strong Kangen™ Water: Not to drink — Strong Kangen Water preserves hygiene in your daily life due to its strong cleaning effect. It has dissolving and heat conducting benefits. Food preparation: Clean vegetables and fish. Enhance the flavor of broccoli, onions, bamboo etc. by pre-boiling them in Strong Kangen water. Cleaning: Clean cutting boards and dishcloths. Good for cleaning oil and tough grime from vents, as well as for general cleaning in the kitchen. Stain Removal: The extra strength will remove coffee, soy sauce and oil stains. Also great for getting out stubborn toilet bowl stains. Dishes: Use less detergent when washing your dishes. Save on water bills, as only one-third to one-fourth of the usual amount of water is adequate for rinsing of detergent. Strong Acidi​​​​c Water: Not to drink — this water has disinfecting properties. Use Strong Acidic Water to sanitize kitchen utensils, countertops, etc. to keep areas safe and clean. Cleaning and sanitizing: Sanitize knives, cutting boards, dish towels, and kitchen cloths, etc. For a more powerful cleaning effect, clean with Strong Kangen water before using Strong Acidic water. Because of the strong acidity, metal that rusts easily should be wiped with a dry cloth. Hygiene: Use Strong Acidic Water to wash hands, and clean and sanitize bathroom surfaces . Commercial operation: Beauty salons, hair salons, restaurants, agricultural colleges, daycare centers, pet shops, and nursing homes all benefit greatly from the use of Strong Acidic Water. You use these waters all the time. The human body is comprised of 70% water, so it’s not much of a stretch to say that “the basis of vitality and long life is water.” If you want to feel good and be at your optimal health level, you should drink water on a daily basis. But not just any type of water. On top of that you will use it for cleaning, disinfecting, replacing chemicals in your house, for your pets, your plants, protecting the environment and contributing to a green planet. We have numerous certifications as you can see here: WQA Water Quality Association, we have a gold seal, We are in good standing with the DSA, only 200 (approximately) companies are members of this highly-prestigious association, ISO 9001 for quality, ISO 14001 for being environmental, ISO 13485 demonstrates our ability to manufacture medical devices and much more!!! 3 to 5 years guarantee and it comes with a 1 month return policy. You can take them with you all over the world, the Leveluk k8 has a Worldwide Multi-Voltage Power Supply, with interchangeable Plug Capability and its Display and Voice is in 8 different Languages. With just the push of a button, you can generate all these incredible water types in your own kitchen. Installation is extremely easy and explained in a short video. Even a child can do it. Filters need to be changed at least once a year or every 3000 gallons. The machines have the best self cleaning system of the industry and Enagic recommends a deep cleaning once a year as well. Ask us as we finance in house. * we calculated that on the minimum life time frame of the machine which is 15 years, the K8 will cost you less than 1 dollars a day for unlimited supply of amazing Kangen water — including filter change, deep cleaning etc. How much are you spending, every day, right now, in bottles water for you and your family? We appreciate the privilege of being able to introduce you to this amazing 40+ years old Japanese Revolutionary Technology!